They focus their attention primarily on major North American sports, emphasizing that U.S. bettors are welcome. With a quick and simple sign up process, coupled with a great sportsbook, a high end casino, and a generous welcome bonus, TopBet easily makes it to the top of our list of favorite online sportsbooks. A match bonus bonus of up to 100 percent that’s easy to understand and collect, is available to all new TopBet clients when they make their initial deposit. You'll earn a 50 percent bonus for Visa deposits, 100 percent for Mastercard deposits and 100 percent for Bitcoin deposits. TopBet's comprehensive sportsbook, with its complete selection of sports to choose from and odds that are competitive with Las Vegas, is one of the top-rated legal USA online sportsbook available today. 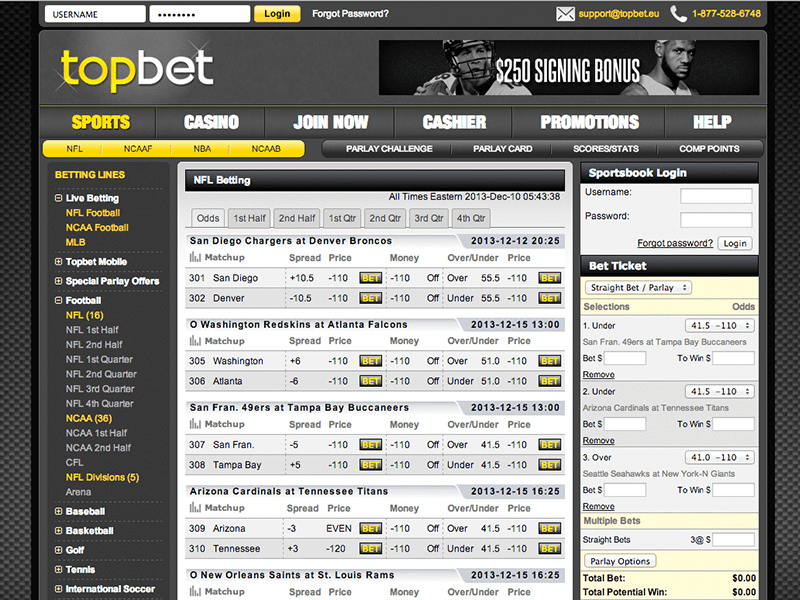 TopBet is available to U.S. bettors. In fact, TopBet caters 100 percent of its business to American wagerers. TopBet will have you placing bets in no time with their simple and easy sign up process. Within a few clicks, after you have entered the required information and preferred method of deposit, you'll receive your bonus! Next thing you know you'll be wagering on all your favorite sporting events or enjoying yourself in the superb TopBet casino. Deposit under $100 and you will receive a 25 percent bonus. Deposit between $100-$199.99 and garner a 75 percent bonus. But if you deposit from $200 up to a maximum of $1000, you earn a 100 percent matching bonus. You must deposit a minimum of $50 to qualify for a bonus. There is no need to worry about the possibility of encountering problems with TopBet. They have thought of everything possible to ensure that your needs are catered for. If you should run into any problem, or have a question you need an answer to, TopBet offers year-round, top-notch customer support 24 hours a day at your fingertips. TopBet also offers a self-serve support section on their website, which is usually more than enough to answer any query you may have. 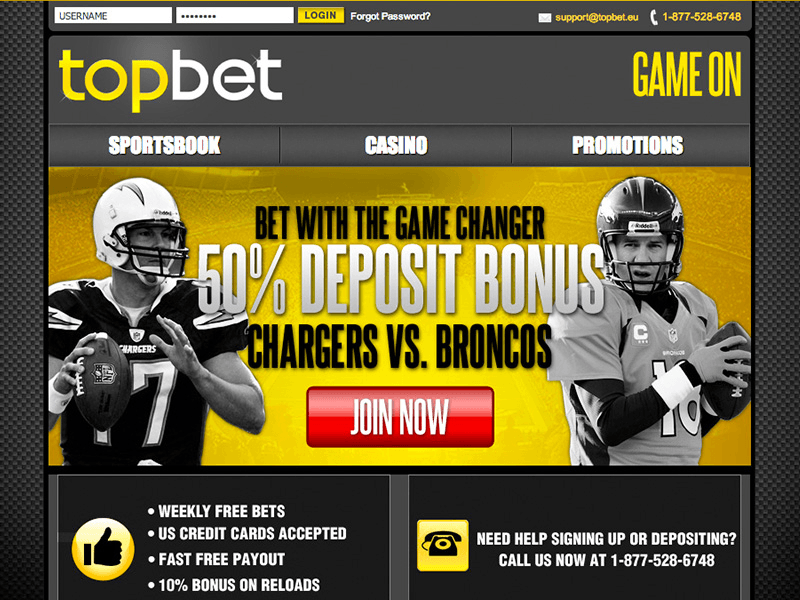 TopBet deposit options include Visa and MasterCard as well as Western Union and check by courier. Withdrawals can be sent to your door via DHL’s courier service, an extremely rapid method to get the return on your winnings, while some countries allow payments to be sent to your credit cards, but it is worth checking with the TopBet customer support team before making a withdrawal. TopBet’s website is colored in a mixture of yellow, white, grey, and black, but it is not garish; it is actually pleasing to look at, even for long periods of time. It is simple to find the betting markets that you wish to bet on, and just as simple to place a wager once you have decided who to bet on. Markets load in a matter of seconds, so there will not be any long periods of sitting around waiting for webpages to load. Nobody has time for that these days. Another bonus with TopBet is the vast array of bettings options available - sides, totals, futures, parlays, teasers, if-bets, reverses, player, team props and live betting. In addition to the 100 percent matching welcome bonus up to $1000, TopBet runs a host of ongoing promotions that are pouring with value. These include $5 free to bet on the casino, a $10 free Monday Night Football bet during the NFL season, a $10 free Sunday Night baseball bet during the MLB season, a $10 free NBA bet offered on Thursday games, weekly wagering contests on top games, a free courier payment, monthly casino tournaments, and even casino cashback rewards. Topbet’s website is packed to the brim with markets to bet on. There are more than a dozen sport to choose from. North American sports feature heavily, particularly NBA betting, but you’ll also find soccer, baseball, MMA, Boxing, rugby union, Olympics, tennis, golf and even entertainment bets, among others. Wherever you might be, you are merely a touch away from your next wager at TopBet. No matter the sport you seek to bet on, you can bet on it via the TopBet mobile app. You can use TopBet from either your mobile phone or tablet, giving you greater flexibility over your betting. Live betting at TopBet certainly lives up to its name. At TopBet, live in-game wagering is offered on a number of sports. All in-progress NFL, MLB, NBA, NHL and NCAA football and basketball games are available for live betting opportunities. One of the first things that strikes you when you visit the TopBet website is how sleek and responsive the site is. Everything is where you would want it to be, the site is easy to navigate, and every page loads lightning fast. Then you will notice the wide array of betting markets to place wagers on, and the excellent odds offered to you in those markets. All of the major North American sports are available - NFL, NBA, NHL, MLB, NCAA and MLS - as well as MMA, boxing, tennis, international soccer and rugby union. TopBet has quickly developed into a major player in the world of online sports betting. Everything you see is presented in a professional package that would put some of its more established competitors to shame. The TopBet casino offers games from two different providers of online casino gaming, BetSoft and Ace Gaming. You'll find play available on slot machines, table games and blackack, video poker, 3D games and fun games like keno. TopBet does not offer a separate racebook, but they do offer wagering on major horse races such as the Triple Crown and the Breeders' Cup. Close Visit TopBet and see for yourself... Bet now!